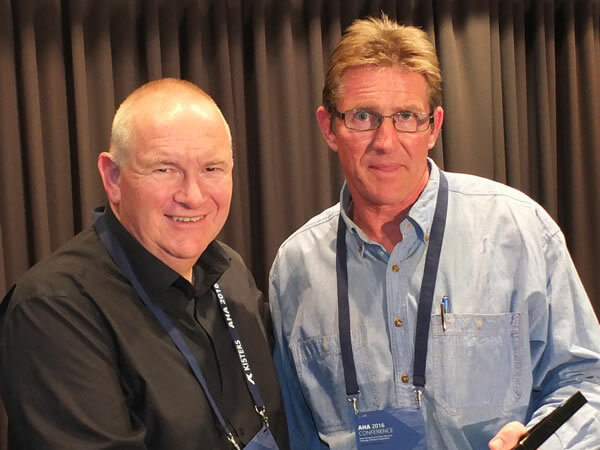 Bill Steen was inducted as a Fellow of the Australian Hydrographers Association with Life Membership on Tuesday 26 October 2016. Bill commenced as a hydrographic assistant with the NSW Department of Water Resources in 1979, where he continued until moving to the ACT administration in 1986, and after privatisation of ACT hydrography, continued with Ecowise until 1999. In 1999 Bill moved to Hydsys as Sales and Marketing Manager, becoming General Manager of Kisters in 2004 which role he still fills. Bill’s AHA involvement goes back a long way. In the 1980s, Bill was AHA NSW Branch Secretary. After his move to Canberra he served many years as ACT representative on the AHA Committee. He assumed the role of Chair in 2007 and continued in this role until December 2015. Under Bill’s watch, AHA has grown significantly, now holding professionally run biennial conferences. Congratulations Bill, for your significant contribution to the profession and to the AHA and on your appointment as “Fellow of the Australian Hydrographers Association with Life Membership”.